There's one more review to cap off the work week, but it's not the last review of the week in general. This is a game that has been trying to come to the Wii U eShop for a long while, but it's finally here. Bean gives us his take on Freedom Planet! Indie platformers in recent years have done a fine job of paying homage to classics of yesteryear while carving out their own niche in the process. Shovel Knight was a fun Capcom-inspired title, Guacamelee! pushed the Metroid and Castlevania buttons, and Azure Striker Gunvolt hit the mark with its nods to Mega Man Zero and ZX. That said, there really hadn't been too many games that went and tried to recapture the magic of the Sega Genesis side of things. Leave it to GalaxyTrail to fit the bill with a title that I should've reviewed last year when it was on the PC but didn't. Well, at least we get a second chance with its debut on the Wii U. Usually the term "dragon lady" is an insult. To Lilac, it's a perfect description. 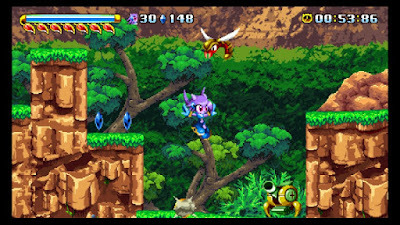 Freedom Planet takes place in the anthropomorphic world of Avalice. Three kingdoms on the planet had a few issues with each other to begin with, but when an alien spacecraft crash lands on the planet, takes out the leader of one of the nations and messes with the mind of said kingdom's son, things quickly turn south. Now the menacing mastermind from the stars named Brevon intends on pitting the world at war while he secretly makes off with the Kingdom Stone, a jewel with an immense amount of power that will strengthen his troops to continue on with his army's galactic conquest. Oh, and that jewel heist would kind of ruin Avalice forever as they wouldn't have a power source left. That doesn't sound good, so we're going to need a hero or two to step in and stop this scheme before it's too late. Good thing for the people of this planet that they have Lilac the purple water dragon and Carol the green wildcat on the case... eventually. is a need to be chased by rolling boulders. 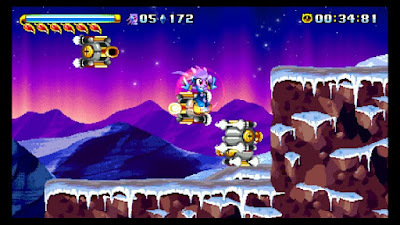 The first thing players are going to think of when they see Freedom Planet in action is the Sonic the Hedgehog series, and for good reason. The game itself was originally conceived to be a Sonic fan title until it dropped the IP's baggage and went off in its own direction. Still, there are plenty of nods to the series left in the game as you'll see plenty of spring pads, loops, elemental shields, and of course, renegade robots to dispose of throughout your tour of Avalice. You have the choice of playing through the game in Adventure or Classic mode. If you go with the former, you'll get plenty of plot scenes between stages. Classic forgoes the story and just lets you play through the game's many stages in order. I'll get it out of the way now and say that the plot can be a little cheesy at times as well as suffering from severe mood swings at times, but all in all, I think I found it all right since the voice actors and actresses in the game all delivered in filling their "Saturday morning cartoon with a slight edge" roles quite well. The gameplay has the aforementioned Sonic features, but you're not tasked to jump onto enemies. Instead, the game employs more of a melee combat system, and that melee combat differs between the two playable characters you start out with. You have three buttons that you can attack with. In Lilac's case, she'll use a quick melee hair whip with Y (that can also be used with Up or Down on the D-Pad), a spinning Cyclone attack that doubles as a double jump with B, and a Sonic Rush-style boost attack with the X button. That boost attack can also be used to bounce off of walls to get to out of reach places fast. On the other hand, Carol goes for a more ground and pound style with her attacks and is allowed to use her Wild Kick special attack more liberally than Lilac's boost. She can also find gas cans lying about the many stages to instantly summon a motorcycle to ride on. That's pretty cool, as is her ability to scale walls either by repeatedly wall jumping up them or just defying gravity by riding her bike up them. There's even a third character that joins the mix after you beat the game's second stage, but that one, Milla the dog that everyone and their mother thinks is a bunny because she resembles Cream the Rabbit, is only available for Classic mode at the present time. she is only available for play in Classic mode. It's a good thing you have a bunch of moves at your disposal because you're going to be needing the diversity because this title will throw a lot of foes at you at times. The clever thing about this is that they can't actually hurt you unless they're attacking themselves or have spiky bodies to work with. 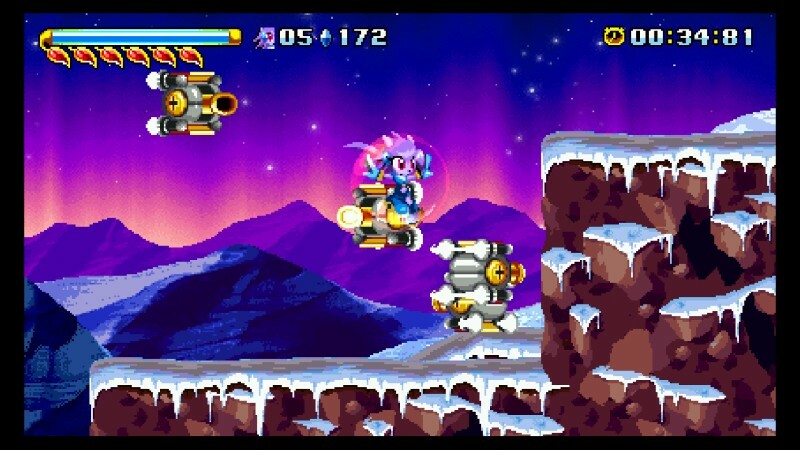 So many times in speed-based platformers, it feels like you have to guess what's coming next, too, but Freedom Planet also alleviates this by having some warning signs pop up when the big boys come out to play. You get a pretty decently-sized health bar that can be replenished by collecting petals, but you also have to keep in mind that if you rush in like a fool, you can easily get comboed by the many challenging bosses or well-placed enemies in your path. The hardest battles I found in the game came from the character vs. character battles that you'll be tasked to take down. Many of these enemies move faster than you do, so you need to play defensively to learn their attack pattern before countering appropriately instead of taking the lead. That's not to say there aren't many giant bots that give off Gunstar Heroes vibes either because they're in this, too, and it's once again, the wide range of battles that keep you on your toes all through this fun adventure. we dare say these things are after burners? Another thing worth mentioning is that the many areas on the planet of Avalice are just incredible to look at. The backgrounds themselves are beautiful enough, but the characters have so many expressions on their face whether they're attacking, walking, talking, anything. It's really a sight to behold, and when you couple that with the game's stellar soundtrack, you have an indie game that goes above and beyond the price of admission which is pretty darn affordable to begin with. I seriously think players will remember both the sights and songs present in Freedom Planet. While running through Avalice, there are plenty of things that players can find to enhance the experience. For instance, all of the non-final stages in the game have ten cards that unlock songs, art pieces, and voice clips along the way. There's also a training mode to get the hang of using a different character, an achievement system that encourages replaying the game as well as a Time Attack mode that does the same, and even a Mahjong minigame on top of that! 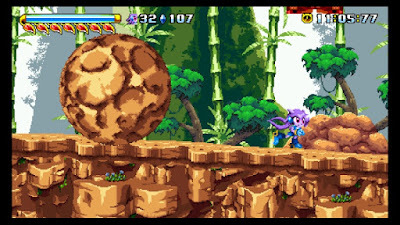 There is one complaint I have with Freedom Planet, and that's that some levels can be quite lengthy, especially those nearing the game's final few stages. It's not uncommon to spend 20-25 minutes in these latter areas if you're exploring around, and even if you're not, it can still take that long just because of the maze-like aspect some of these stages possess. The difficulty also ramps up accordingly, so those twenty-minute affairs can quickly turn into trying experiences if you aren't accustomed to platformers. At least you have the option of switching the game's difficulty on the fly if you're finding it difficult and even get plopped right back down where you fell if you do run out of lives, so there's that. 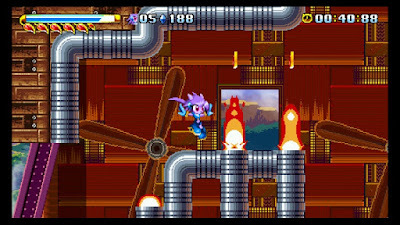 Both of my playthroughs of Freedom Planet were on normal difficulty, and it gave even me a run for my money at times on some of the final levels, so don't feel ashamed if you have to tone it down a bit. It's nice to have the option in case you're struggling, and I've already seen many a player on Miiverse having those issues, but I find it to be a fair and frenetic challenge that will probably take most players three to five hours to clear for the first time. You just have to use your head is all. Whoa! You enemies need to take some time and chill out! 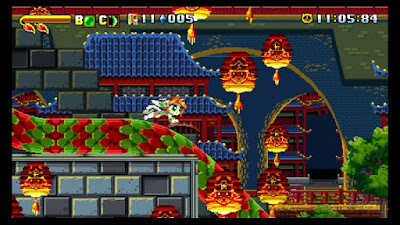 In the end, Freedom Planet succeeds at being the Sega Genesis-stylized platformer that it sets out to be. You can feel the passion and quality of care put into making sure that this game recaptured that 90s magic while also carving out its own identity in the process. With the amazing amount of content and supposedly more to come, I have to recommend this one as it's up there with some of the finest indie platformers I've played in recent years. With the quality of those titles, that is some strong company to keep. Whether you go with the Wii U or PC version, the price of Freedom in this case is absolutely worth it. Yep. Review copy provided by GalaxyTrail.